Armed Hezbollah thugs continue to roam the streets of Beirut today. Lebanon’s highest Sunni religious authority, Grand Mufti Rashid Qabbani, lashed out at the “armed gangs of outlaws” and call on Hizballah leadership to immediately withdraw them from Sunni neighbourhoods and warning that Lebanon’s Sunnis “had had enough”. He also pointed the finger at Iran as having a hand in today’s violence. Christian Lebanese Forces leader, Samir Geagea, referred to Hizballah as the Mahdi Army in Lebanon. 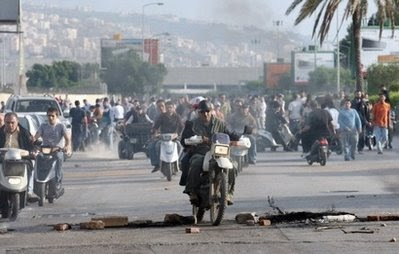 Clashes between government supporters and the opposition escalated in Lebanon on Thursday, with gunfights in several parts of the country, roads blocked and the international airport virtually shut down. At least eight people were reported wounded in the east and the north as a general strike took on a sectarian tone, pitting mainly Sunni Muslim supporters of the Western-backed government against Shiite followers of the Hezbollah-led opposition. All eyes were on Hezbollah chief Hassan Nasrallah, who was due to hold a rare news conference via video link later in the afternoon in response to government moves against his militant group. The army and riot police spread out in Beirut while many schools and businesses in the capital remained shut for the second straight day. 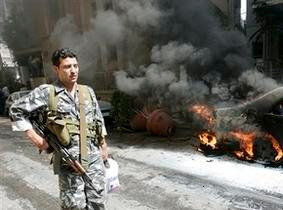 Armed men, some hooded or masked, were seen in several mixed Sunni and Shiite neighbourhoods. Protesters burned tyres and lit fires inside large metal rubbish bins along the airport road, which remained blocked by large mounds of earth dumped by Hezbollah supporters on Wednesday when a strike over wages degenerated into sectarian violence. 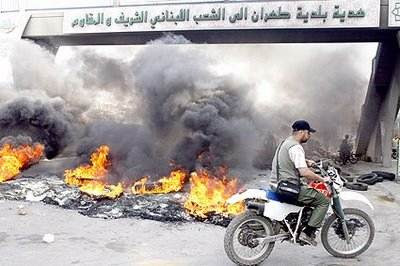 Hezbollah blamed the pro-Western democratically elected government for the Hezbollah rioting. UPDATE: Now, Hezbollah is saying that the government has declared war on them. UPDATE 3: There was at least one death reported. Saudi Arabia warned Hezbollah to back off.